So we're in the middle of opening Christmas gifts. Have you ever seen an eight-year-old tear through gifts? You get the idea - that's how it was going. But then he opens a book, and everything. stops. completely. 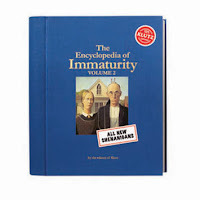 The book that stopped my son in his tracks is The Encyclopedia of Immaturity, Vol. 2. It's every bit as silly as Volume 1, with lots of ideas about how to act immature and do really silly things like how to: talk like a pirate, take off your underwear without removing your pants first, pick the lock on your sister's diary, paint a kid's face without him knowing about it. You can see why my son couldn't put it down. If you have a kid in your life, this is the book. They will love it, and it will get them reading. You can see for yourself - Santa brought him a bike! And he still sat down and read the book. My mom was already on the phone telling her friends. Was it a Christmas miracle? OK, well not really but almost. Klutz sent me this book, btw - but I was going to get it anyway. Klutz stuff goooood. That was in my Santa letter! It looks such fun. Well, if Santa didn't happen to bring it, it's definitely worth the money to buy yourself - Vols II or I. Fun! Incidentally, I just read your latest Lava Literacy newsletter, and it was great. thats so cool!!! Has he done anything or tried. If he has it must be fun. Lol, definitely. He keeps trying magic tricks on us, or trying to make things disappear. It's very funny. I love this post, Joyce! Nothing like a kid ignoring other, flashier Christmas presents, in favor of the right book.